Lubritz & Nasri, PLLC is the longest established Otolaryngology practice in Nevada, and has provided comprehensive ENT care since 1972. Our practice is composed of four board certified Otolaryngologists, a doctor of Audiology, and two office locations, to better serve all areas of Las Vegas valley. Our practice treats ear, nose, and throat problems, from general ENT issues such as ear infections to complicated head and neck cancers. Our physicians are also dedicated to providing the most comprehensive exam and treatment plans for your sinus, breathing difficulties, tonsil infections, snoring, and balance disturbances along with many other conditions. Our center specializes in providing exceptional ENT care for all our patients to diagnose and find the best treatment plan for you. Daily interactions relies heavily on our facial expressions. Read more about our reconstructive and cosmetic facial plastic surgery options. 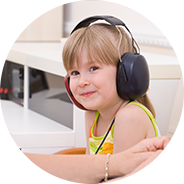 Our doctors are well practiced in Audiology and are able to evaluate hearing and treatment options for hearing loss at any age.